...fire burn and cauldron bubble. When I'm dyeing I alternately feel like a mad scientist or a witch leaning over her cauldron. But it's always fun. Today I finally got up the guts to throw my last 2 skeins of "the base" into the dyepots. To test my method and see how it works. It worked pretty well. I know it doesn't look like much. But once these cool off I will rinse and give them a nice shampoo and they will be ready to dry and re-skein. They turned out really pretty. I had one issue where color didn't saturate a certain point. But I fixed it up right quick, and I'm very pleased that the fix worked. I love learning new things. And the dyeing stuff is just fascinating. I love being able to predict results and knowing how to fix things if anything doesn't go exactly as planned. I had planned to move my dyeing operation (yes, you can laugh) out to the garage. The man has cleared the bar for me and there are plugs and running water and a sink. But it's too danged cold out there! Mock me if you must. Yes, I know I live in Florida. Yes, I know half the country has been blanketed in snow and ice. But right now it's under 30 degrees here. That ain't right. I think we have had more freezes this year than in all the other winters that I've lived here combined. And I don't have a proper winter coat. It's not good. 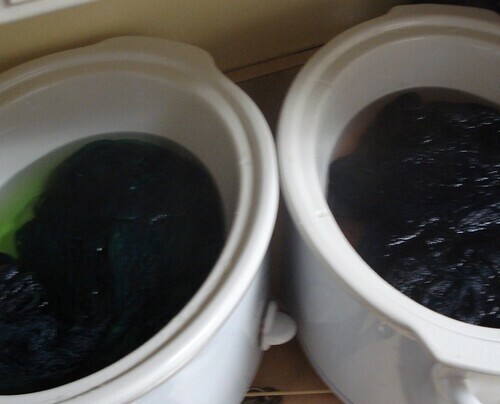 So I'm hoping for warmer weather and keeping warm by the steam of the dyepot!